Australia won by 8 wickets. And as the last few fans start to drift away from Old Trafford, another English international summer comes to an end. It's been a rollercoaster ride with this summer's games against New Zealand and Australia. Never predictable - but that's why we follow sport, isn't it? the first Test against Pakistan begins in Abu Dhabi a month today. TMS will be there - and we'll be setting our alarm clocks to bring you the live text, with matches starting at 07:00 BST (and 06:00 GMT when the clocks go back after the second Test). But until then, pour yourself a measure of your favourite beverage, put your feet up and relax - the Ashes belong to England again. Thanks for your company all summer, we'll see you soon. Steve Harris, Scarborough: So. 11 matches played and England win 6-5 (and get the Ashes back). I'll take that. I think most England supporters would! Australia coach Darren Lehmann on Sky Sports: "I'm very pleased with the young fellas. I think we lost two-thirds of our World Cup-winning side. It gave the young guys time to play. "We are good at it, winning, certainly in the one-dayers, maybe not in the Test matches. "There is a bit of rebuilding to do but great times ahead. These players have got what it takes. They can do what they need to do but it's knowing when to do them. We have got some depth which is pleasing." Shiv, London: Disappointing BUT if you had said after that World Cup that we'd beat NZ and take the Aussies to the last game and I would've laughed! Laid good stepping stones! Australia captain Steve Smith: "It was an extremely satisfying win. The boys came out and played some good cricket. "But I must say I've got a lot of concern for Eoin and hope he is OK. This team has been through a few tough things and you never want to see that happen out on the field. "[Bowling] is one part we haven't done well but we hit some good areas and let the wicket do the work." Chris, IOW: Bad today but on the whole hopeful stuff from England -openers a worry but both captains give team a good future. Steve Smith receives the pelican-shaped ODI trophy before the champagne starts to flow. I wonder if Heathrow will charge him excess baggage tomorrow? (Australia is the only place which has ever charged me for it!). Mitchell Marsh, by the way, was not only man/Mitch of the match - he's also picking up the champagne as man of the series. The Aussies are getting their medals from ECB chief Colin Graves. Late call-up Peter Handscomb is the last man up... but as he didn't actually make an appearance in the series and remains uncapped, his employers Gloucestershire will hope he remains able to play for them on his UK passport as a non-overseas player. Anders: England exposed as relying too much on Morgan. Middle order hasn't performed at all. "For me, there's only one moment of the summer - Stuart Broad bowling them out at Nottingham. 8-15 - it was pure theatre. He won the Ashes in two hours. I've only seen one magic moment like that in 50 years of playing and watching cricket, when Curtly Ambrose bowled England out for 46 at Trinidad." Australia's Mitchell Marsh, who took 4-27: "It's been a good summer. I've been working on my bowling for a few months now and it's good to be contributing to the team now. In a wicket like that, it's important to put the ball into the right area. I want to keep improving in both facets of the game." Australia all-rounder Mitchell Marsh who took 4-27 is named as man of the match. (And indeed, Mitch of the match). England stand-in captain James Taylor on TMS: "Eoin got an unbelievable ball from Mitchell Starc, he was a bit groggy and hopefully he can just rest up for the next few days. That injury probably did cost us, it's not good to see a member of your team hit like that but the guys have got to put it to the back of their minds. Credit to Australia, but on our part we weren't good enough in that middle section. It wasn't our day today." More from Australia captain Steve Smith on TMS, on Eoin Morgan's injury: "It's never good when you see someone hit on the head, so I hope he's OK. Mitchell Starc was a little bit shaken up, he was close to Phillip Hughes." A bit of TMS housekeeping - you'll be able to listen to commentary on the County Championship Division Two title decider between Lancashire and Surrey on BBC Radio 5 live sports extra (and online) from tomorrow morning. And the One-Day Cup final between Gloucestershire and Surrey next Saturday will be on BBC Radio 4 Long Wave (and online) - but not on Sports Extra. Australia captain Steve Smith on TMS: "It turned out to be a good toss to lose, the guys were able to bowl in good areas and reap the rewards. We are the world champions, but only four of us in this XI today were in that World Cup final side, so it's good to have depth. Hopefully this young group can keep playing well." listen to it again as a podcast. And there will be champagne flowing in Yorkshire - they've just won the Women's County Championship. Australia's squad for Bangladesh will be named later this week, we expect. I wouldn't expect we'll have to wait too long for England to name their squad to face Pakistan in the UAE either. Stay with us for the presentation, which will be coming up soon. Robert Wolf Petersen: C'est la vie. Perhaps bring Moeen, or even Willey, up to open next time we play ODIs. Vince has to be due a knock soon. "There's a view forming that with David Warner out injured for Bangladesh, it could be Shaun Marsh opening with Joe Burns. Burns is a bit like Alex Hales - before this series he was a lock to open in the first Test in Chittagong, but he's had a run of low scores here. You're also looking at Usman Khawaja or Cameron Bancroft. I think they'll be resting Johnson and Hazlewood in Bangladesh, so Starc may lead the attack, but he's had a huge workload as he plays all formats and the IPL, so they may be tempted to go with Pattinson and Cummins." "There's just enough time for Australia to get home before they go on tour again. But long term, Australia just need to find a couple of substantial batsmen from somewhere, and they'll be OK."
Trevor Allison: After a fantastic summer of revolutional ODI cricket Eng decide to go back to pre-World Cup shambles! Thanks for the memories. "When they got here in the third week of June, Australia would have been expecting much more from this tour. They did a demolition job in the Caribbean, which England didn't manage, and all signs were pointing towards an easy retention of the Ashes. But as we saw in those back-to-back Tests in the Midlands, it wasn't to be. There will be some soul-searching, but this being international cricket, they're off to Bangladesh in a couple of weeks." Mo Mustafa: At least the last two matches prove winning the toss does not guarantee a win. Evan Samuel: A poor game but a good finish for Oz, particularly after losing two on the spin. Hope Morgan is OK.
"I think England kept Rashid on too long, they should have gone to Moeen Ali a little earlier if I were in James Taylor's shoes." Vic Marks adds: "You wouldn't fit into James Taylor's shoes." And so, a marathon tour ends - England win the Tests 3-2 and the Twenty20 international, but Australia win the ODIs 3-2. "Everyone thought this was a great toss to win, but the game was won in the first hour by Australia. England have underperformed. They've been thrashed today and Australia will go home with a trophy." "A disappointing match for the neutral, perfect for Australia, and they won it in the first hour." "England had hope of a series win but Australia snuffed that out with a superb performance with the ball." That's the ball game - Bailey slices a four through the vacant slip cordon and Australia have won. Topley bowls, Finch nudges, a tumbling stop by Moeen at short fine leg cuts off the winning hit. They run one. Bailey can't get the last ball away. Safe to say Finch should finish it this over. "I've been asked about the man of the series, but I don't want to betray the answer I gave. But I think I know who's got it. There are a lot of candidates and the written press have been quite meticulous in their selection." Bailey goes down the ground... but it's picked up at long-on and they can only run two. Four to win. Si in Kent: Looks like this match will end with less than 60 overs bowled in total. Can't they play a quick 20/20 match to give the crowd their money's worth. This is taking the mickey now... Bailey cheekily reverse-sweeps Moeen for a single and exchanges a joke with the bowler. A single from Finch means it's six to win. A challenge for Bailey to do it in one hit? "As individual games, the New Zealand Tests were better than any of the Ashes ones." Australia keep chipping away at their target, two singles and a leg bye reduce the requirement to eight runs to win. From 27 overs. "It's been an odd summer - there's been a lot of drama, but not necessarily tension in the matches themselves." Nothing's going England's way at all here - Topley bowls a bouncer, Bailey ducks, Bairstow underarms a throw to the stumps which is wide, and the batsmen run a bye. To add insult to injury, it's signalled as a wide so it's counted against the bowler. Finch helps a single off his legs, and another loose delivery is tickled away by Bailey for four leg byes. 11 to win. "The regret this summer is that, even though it was a captivating Ashes series, we didn't get any close games. It won't go into the annals like 2005 which was the best series I've ever seen." Finch, sweeping to order, is not going to have enough runs available to get a century here - but he's looking at an 80 not out here. Another four and a two take him to 66 from 60 balls - Australia need 18 from 28 overs to win the series. "The crowd are doing a slow Mexican Wave - it probably shows how much they are watching the cricket. There's nothing to keep them interested now." The increasingly restless crowd attempt a Mexican wave - a sure sign of boredom among a beered-up cricket audience - as the match continues to drift towards an inevitable conclusion. Finch and the grinning Bailey keep the scoreboard ticking with ones and twos. Rachel T: Shame we couldn't finish the summer with a thriller, but we have the Ashes & that is the whole point of playing Australia! Alec Stewart has his wish - ODI rookie Reece Topley is on, bowling his left-arm seam round the wicket, and he's charged with a wide before the irrepressible Finch punches a four down the ground, and opens the face to knock a single to third man. He has 57 from 55 balls, Bailey has 32 from 34. Richard Parfitt: It's one of those days where you watch out of obligation, rather than enjoyment. 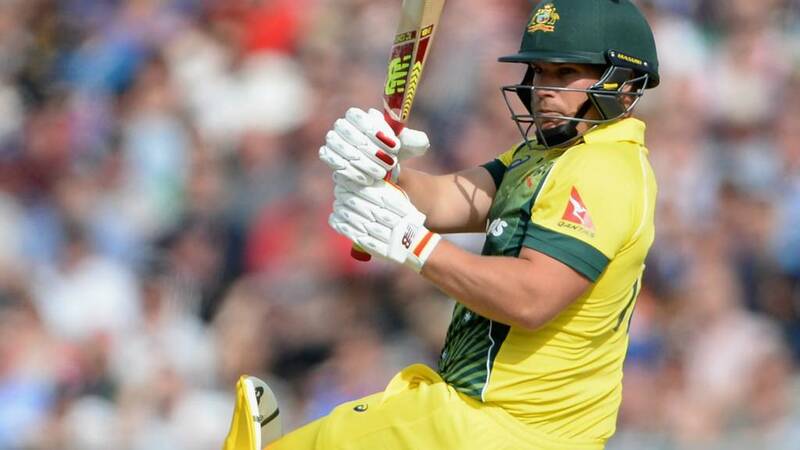 This is a ninth fifty for Finch in his 52nd ODI, by the way - he also has six hundreds. Might he be in the shake-up for the Test squad in Bangladesh, given that with Chris Rogers and Shane Watson retired from Tests, and David Warner injured, they need (at least) two new openers? "Aaron Finch hits the ball so hard, he's no nonsense against the spinner." Finch clubs Moeen for a couple of fours with two powerful sweep shots - with a half-hearted lbw appeal between them - to bring up his fifty from 47 balls. Australia are also into three figures. "It doesn't feel like there's been an overarching explanation to this game, England have just had a bad day at the office." To the continued surprise of Alec Stewart on TMS, Adil Rashid is still bowling - and the third-wicket pair of Finch and Bailey (who sound like a TV drama detective duo) continue their unruffled progress - three singles and a two. Transport for Greater Manchester might be advised to get some extra trams running on the Altrincham line, there will be queues at Old Trafford soon. John in Swindon: If, as seems likely Australia win here, it will be 6-5 to England across the whole summer. Probably an accurate reflection of the merits of the two sides. It's going to be spin from both ends, at least for a little while, as the splendidly-bearded off-spinner Moeen Ali takes over at the Pavilion End. Bailey and Finch plunder a couple of singles as Moeen keeps it tight, but these two look in absolute control. Only two off the over, but only 48 more needed from 32 overs. "It's worth getting Reece Topley into the attack now, just to expose him to more 50-over international cricket." Jack Mendel: Leggies always bowl a bit of rubbish. Rashid seems to bowl not enough magic in between bouts of rubbish though. A slight surprise as Rashid gets another over, after going round the park last over - after a single takes Bailey to 28, Finch powerfully sweeps another four to move to 40 from 38 balls. "It's been all about Australia since the break. England would have talked about taking early wickets but it didn't happen and Australia have done exactly what they needed to do. It will take a bit of magic for England now." Charles and Alec on TMS have spotted a couple of Teletubbies nursing fresh pints of beer in the crowd - "let's hope they don't get too Dipsy" quips Mr Dagnall. But England's bowling is a bit La-La at the moment as Finch clubs Wood for another four. Not much their Tinky-Winky stand-in skipper, the diminutive James Taylor, can do from here. Australia need 55 more from 34 overs. "Finch sets up well. He plays the ball late and hits it back where it comes from, which are the attributes you need when playing in England. It's amazing he has had such a poor time at Yorkshire." Finch steers a two to the slightly dawdling Moeen Ali at third man - he's not had a lot of the strike in the last couple of overs. A lovely-looking off-drive beats the diving Topley and Australia are going to win this at a canter. "Australia are careering towards victory here. It's a bit of a hiding to nothing for Adil Rashid without having the runs on the board." Now it's Bailey's turn to tuck into Rashid, helping himself to a two before dragging down a half-volley which Bailey punches through cow corner for four. After two more fours, both pulled wide of long-on, that's 24 runs in two overs from Rashid and probably the last we'll see of him in this series. Australia are more than halfway to their target. An attacking move - with not many runs to play with, England bring in a second slip. They need wickets. Having begun with those three fours, Bailey tips-and-runs his first single into the covers. Finch dabs into the covers, a risky single to the fleet-footed sub fielder Sam Billings (on for the concussed Eoin Morgan) but Finch makes his ground ahead of the Kent man's throw. Wood bowls a probing line to Bailey, with a slip in place, but the Tasmanian moves his score to 12 - all in boundaries - as he cuts for four. Finch continues to plunder runs from his Yorkshire team-mate Rashid, expertly placing a very fine sweep for three past the keeper - in fact, it's signalled as leg byes. Australia need 85 more from 37 overs. just carried her bat for Berkshire today, scoring 162 not out from a score of 262-9 against Sussex in the Women's County Championship at Horsham. England turn to spin for the first time - Adil Rashid often leaks runs, but often takes wickets. The leg-spinner's dilemma? Finch cuts his first ball for four - and swats the second over long-off for six. Ouch. Al in Cardiff: Best moment of the Ashes was listening to first morning of the Trent Bridge Test on holiday in Marbella. I kept jumping up and down as each wicket fell and people round the pool must have thought I was nuts. England persist with Mark Wood at the Pavilion End after he removed Steve Smith in the over before the break. Opener Aaron Finch gets the scoreboard moving with a single again, while the crowd sound a little rowdier than before lunch - perhaps a Sunday lunchtime pint or two has taken effect. But when Wood sends one down too short, Bailey pulls him for four. Stand-in captain James Taylor is still under the lid at short leg - not normally a place for skippers to field, though I remember Mark Nicholas taking a couple of bat-pad catches in the 1988 B&H Cup final for Hampshire against Derbyshire, after posting himself there. It's David Willey to continue at the Brian Statham End, having taken 1-13 from five overs before the interval. And it's now three maidens from six overs for the Northants left-armer as he doesn't give George Bailey an inch. "England have got to strangle George Bailey, make him play a big shot. The longer they can keep them under 50 the better." The TMS discussion concludes with mention of some of the sensational catches we've seen this summer. We're ready to go again at Old Trafford - Australia are 36-2 after 10 overs, needing just 139 - that's 103 more - to win from the last 40 overs. "The perception at the start of the summer was that England needed to prepare slow, flat pitches to negate Australia's fast bowlers. But then it became clear that slow, flat pitches were the last ones England would want, as they couldn't get Australia out." "At the start of the summer, England had no chance in the Ashes. After the New Zealand series, a little chance. After the first day at Cardiff, I thought it could be a little different. But then after Lord's..."
Mark Wood will always have a place in Ashes history - having bowled the delivery to win the Ashes when he castled Nathan Lyon at Trent Bridge. "Just when you think you've seen all the different types of interval entertainment, Old Trafford comes up with a belter. At one end of the wicket is a washing machine. I think the door is open and the drum exposed. At the other end, men and women with cricket balls. Is the objective to hit the machine or get the ball in the drum? Either way, it's brilliant. However, I'm not sure how much use the machine is after it's been clonked with leather." Robert Wolf Petersen: Win or lose today, I'm happy with the direction this England side is heading, both in ODIs and Tests. That look on Stuart Broad's face in that Trent Bridge match - when Stokes took that catch - also has won a few votes as one of TMS's moments of the summer. "Stokes has been a revelation this summer as he's always in the contest. If he's not scoring runs, taking wickets or catches, he's involved in controversy. His spell in the second innings at Trent Bridge, when Australia got to 100-0, he got the ball hooping around. He's always going to produce spells which win you a game on his own." Ben Stokes's brilliant one-handed catch off Stuart Broad at Trent Bridge is the latest moment under the spotlight. A sensational grab. "An oddity of that spell from Finn was that he was swinging the ball more than I can remember him doing - bowling fast away-swingers." TMS are now remembering Steven Finn's renaissance in the third Test at Edgbaston. "It was a massive moment when Haddin dropped Joe Root at Cardiff. Root was dropped for that final Test at Sydney so his memory bank wouldn't have been good. If he had walked off with England 40-4 they might not have recovered and we might have been looking at a different result." Andy Plowright: The result today is irrelevant. We won the Ashes - and both the sun and Smith are out. Perfect. "It looks to me now as if the focus is very much on who are England's best one-day cricketers. For the first time, we might see five or six real one-day specialists in the side." Alex Perkins: All this praise for Ben Stokes this summer! What about Joe Root? Class performance and calm batsmanship throughout. Now No 1! "No-one wants to look stupid. That's the bravery which Ian Botham brought to the game - he was prepared to fail spectacularly." "That one-day series was good for the senior core of the team who weren't involved - Cook, Bell, Anderson. With that modern way of playing, I've never heard the roars from the crowd get so big." "One thing I would take away from one-day cricket this summer is that you've really looked forward to coming to one-dayers again." Jonny Bairstow seeing England home in the final ODI of the record-breaking New Zealand series is the latest moment to look back on. "Peter Moores was always quoted as saying that they wanted to play more exciting cricket, but it never seemed to permeate through in their selections. It only came through this summer." John from Little Baddiw: I still have a feeling there is a twist left in this game. "You've got to put Paul Farbrace into the equation. He was the interim coach at the time, and allowed England to play with that freedom. At 30-4 a year ago, I question whether they would have gone out and played as freely as they did at Lord's. They have a group of younger players who naturally play that way." Brendon McCullum also features in the review of the summer after he hit his first ball for six in the second Test at Headingley. "Stokes, someone unburdened by the politics of the World Cup, came through and they put the troubles of the past behind them, playing in a very positive way in all formats. A heartening summer." Ben Stokes bowling Brendon McCullum first ball also got a few votes from you as a moment of the summer. "Joe Root, Alastair Cook and Stuart Broad had good summers but I think Ben Stokes has been the pivotal figure. It was his presence at number six on the first day at Lord's against New Zealand that got them out of trouble before he got a hundred in the second innings. He's had that X factor, been that powerhouse." Here we go on TMS - the first moment of the summer they're looking back at is Ben Stokes's record hundred against New Zealand at Lord's, coming from 85 balls - the fastest at the home of cricket. England Physical Disability captain Iain Nairn on TMS: "Hopefully the Red Cross can get more countries to come and take part. But it probably needs the ICC to get involved. The dream would be to hold a full World Cup - I'm 35 and it would be great if there was a World Cup in my lifetime, ideally in the UK. But it might have to be on the subcontinent as there were tens of millions of people watching us on the TV out there." Anonymous: Travelling 400 mile round trip to see England win Ashes and watching 39 mins of cricket at Trent Bridge on day 3. 2nd best whole pub rooting for Australia on Friday to bat as long as possible to go to day 3! Biggest applause on winning Ashes to umpires for taking them off for bad light on Friday night. Please remember to put your names on your texts. Chris Mcgleave: I'm far from disappointed. Yes it looks like the series is gone. But this is an exciting young side that will have ups and downs. England Physical Disability captain Iain Nairn on TMS: "We've got some guys with cerebral palsy, some amputees and some guys who have had cancer and have artificial knees. We don't noticeably limp - though I can spot a leg amputee because of their gait - but we fancy ourselves to take most catches, and we don't use runners or anything. This is the beauty of cricket - you can play, as long as you can match the level of your disability to your opponent's." Our final cricket vote of the summer has now closed. We asked for your moment of the summer and 51% voted for Stuart Broad's first over at Trent Bridge. In second was that amazing Ben Stokes catch in the same innings at Trent Bridge, and third was a tie between Glenn Maxwell's boundary catch in the fourth ODI and Brad Haddin's drop of Joe Root at Cardiff. You can find the full results on the right-hand side of your screen, or via the "Vote" tab. Stand by for more champagne moments of the summer on TMS. Joseph Stead: Maybe not champagne moment, but cheese moment was the crowd offering Mitchell Marsh a cheeseboard in the final Test. TMS are speaking to Iain Nairn, captain of the England Physical Disability side which won a tournament in Bangladesh this week - but after that, they will be replaying some of your "champagne moments" of the summer. Ben Fox: Unless the wicket is essentially a road - then Steve Smith is an average batsman. If you're wondering why we've stopped - the regulations provide that if the team batting first gets bowled out this early in an ODI, they have a 10-minute interval, then Team 2 bats until the scheduled interval. "We have had 11 wickets and a retired hurt in 43 overs of cricket." England bowling: Willey 5-2-13-1, Topley 3-1-17-0, Wood 2-1-4-1. "Aaron Finch is an Aussie who plays for Yorkshire. That's not a good combination at Old Trafford." Looks like a bit of time-wasting from Australia to ensure they won't face another over before lunch - Finch wants a replacement bat for the last ball before the interval. He survives - Australia need 103 more from 40 overs. But now it's time for some food. "It's a good start from James Taylor in his role as leader of this team. He's done it before though, for Notts and England 'A'. He's going under the helmet now. That's leadership for you." Brave leadership from stand-in skipper James Taylor - he dons a helmet and posts himself at short leg for the new batsman Bailey. But he can do nothing as Bailey punishes Wood with a fourth through the covers. Steve: Will Taylor put the spinner on for an over before lunch? "He went for the cover drive, it left him a fraction and it was a regulation edge snapped up by Jonny Bairstow." It's the wicket England would have wanted - Cap'n Smith drives at Wood and it's a second catch for Jonny Bairstow. Will Australia defy convention and send out a lunch watchman? Nope - it's George Bailey in at four. "It used to be the case that in domestic 55 over matches, there was a lunch and tea break. That meant you might start your innings 10 or 15 minutes before tea and you'd play a bit more cannily then." Plenty of white fluffy cloud around - we're only a couple of six hits from Old Trafford, here at Beeb Towers in Salford Quays - but don't expect any Mancunian rain to save England today. Finch is watchful against the economical Willey - it's another maiden over. Ben Pathe: Disappointing innings but timely reminder that this England side is work in progress. Had a summer of huge progress. England make that early change - Mark Wood replaces Topley, who has 0-17 from three, at the Pavilion End. The Durham right-armer starts with two slips, but keeps it nice and tight for a maiden over, with his pace pushing 91mph. "I used to like batting at the top of the order in one-day cricket because there were plenty of gaps, meaning you got full value for your shots. However, if I got a free hit early on I'd find it disorientating to switch gears." England continue with their two left-armers for now, though I'd have thought Mark Wood will get a bowl before the interval. Willey bowls, Smith helps himself to a two, so both batsmen are into double figures. - and the Aussie captain nudges a single to long leg to keep the strike. imogen: Has to be England v New Zealand @ Lord's day five, I was there and the atmosphere was electric! Test Match Special have been asking for some of your champagne moments of the summer - and will be playing a few during the interval. The runs are flowing off Topley's bowling at the moment - two singles are added, the second of which comes off a no-ball so Finch will receive a "free hit" ball. Taylor can change the field as it's a different batsman facing... but the pugnacious Finch blasts the "free hit" ball for four through long-off. Australia need 111 more... from a mere 44 overs. "The attraction of Topley is his ability to bowl at the end of the innings with his variation of pace and cutters. He's an interesting player because there are not many left-armers who bowl over the wicket from that height." Too short and wide from Topley, and Finch cracks him through cover point for four, before showing he's equally good on the other side of the wicket by pulling another four past the square leg umpire. If you're only just joining us, England captain Eoin Morgan is not on the field and has been ruled out of the rest of the match as he was hit on the helmet while batting and suffered concussion. James Taylor is standing in as skipper, with sub fielder Sam Billings on the field. "Steve Smith won't flash his way to this target. He's playing very watchfully so far." Willey is a bit off with his radar as he sends down his second wide of the over, England really don't have too many runs to play with here. We have just over 20 minutes until the players go off for "lunch". Harry Leitch: Good to see Russell Brand taking the new ball. A smattering of applause around Old Trafford as Smith, boot now in good order, laces Willey through the covers for four. After waving his bat at a wide, Smith is momentarily discomforted as Willey finds a bit of bounce and the right-hander has to fend one off from his chest. Steve Smith has a screw loose - literally. The game is held up while he readjusts one of the studs in his boot. "Reece Topley has 1985-style George Michael stubble on his face. He isn't express pace - it's just 81mph - but it's his height, bounce and late swing which poses a problem for the batsmen." Those two short mid-wickets are in place again as Smith faces Topley, who strays with a wide. Just a single off the last ball of the over for the Aussie skipper. Mark Hefter: Good battle between Burns and Hales for worst opener of the series slot. Hales maybe edges it with the non referral today. Finch survives the rest of a probing over from Willey, who is soon to leave Northants for Yorkshire. (His new-ball partner Topley is also on the move, set to leave Essex for Hampshire after the end of this season). "Because of the angles, an average left-armer is more effective than a right-armer. Not that I'm saying David Willey is average, just that was an average ball to get out Joe Burns." There are two short mid-wickets posted for new batsman Steve Smith - one of them is substitute fielder Sam Billings, on for the concussed Eoin Morgan who will play no further part in this game. And Aussie hearts are in mouths as Smith lifts the ball in the air... just between those two fielders. They run three. "As bad a shot that was, I'm going to praise David Willey. He's been swinging the ball into the right-hander and then he just pushed that one away. England need to take another two wickets before the interval if they want to win this game though." Gone! A wild swish from Joe Burns as Willey slants another one across him, a feather of an edge and it's an easy catch for keeper Jonny Bairstow. Do we have a game on? The bearded Topley completes a maiden over. That leg bye is the only addition to the score so far. Matt Comben: Even if we lose this match we have won five and lost five ODIs against the two World Cup finalists. That's a dramatic improvement on the shambles we've had to endure for the last few years. The tall, dark-haired Reece Topley will take the other new ball - so when did England last open the bowling with two left-arm seamers? Just the one slip in - a slight surprise considering it's wickets-or-bust for England. Finch works a leg bye to get the scoring under way. Stoney: What a let down! After levelling it up I thought we might win it but when it came to the crunch we folded like a dodgy deckchair. We're going to play until 14:00 BST by the way - and then (assuming Australia haven't knocked off the runs, or been bowled out by then) we will have a "proper" 40-minute interval. Burns sees off the rest of Willey's opening over, showing a straight bat to the left-armer. Maiden over. And here's a positive for England - Australia are behind the required run rate, which is up to 2.84. Darren in London: Unhappy with England. Chance to win the series against the current world champs. Disappointed with the lack of patience & poise. That's what cost the Aussies in the Test series. The crowd are cheering any chance of an early wicket here - the right-handed Burns is hit on the pad by the first ball from left-arm seamer Willey, who then slants the next ball across his reach and has him playing and missing. An "ooh" on both occasions. And we're ready to go. Joe Burns and Aaron Finch opening for Australia, with David Willey taking the new ball. Stand by. "Alex Hales has had a poor series, he's not done himself any favours. Against proper pace bowling, his technique needs improving." If you're not aware, this is a scenario where the team batting first has been bowled out so quickly that we're going to have a 10-minute interval, after which Australia will bat until roughly the time of the "scheduled" break. So you've time to make a cup of tea, but not to get stuck into a big roast lunch, I'm afraid. Ben Thapa: It looks like Hastings has grown thicker hair since 1030. I mean, why not reverse the ageing process, the way he's bowled? Thanks, Marc. Well, how do you follow an innings like that? With Eoin Morgan playing no further part in the game, we've had some suggestions that Steve Smith ought to elect not to bat to even up the teams. Or perhaps he could bat in a walrus mask? So, not the score England were thinking of when they won the toss and chose to bat first. Australia are about to bat for 45 minutes before the scheduled interval. Here to talk you through is Mark Mitchener. "Credit to Australia - they bowled quick, they bowled straight, and took five lbws. With Taylor captaining, I want to see a couple of slips and a short leg. They're not going to be able to contain Australia for 50 overs - they need to bowl them out in about 30." Andie: Don't know what all the fuss is about, Morgan would have got a hundred, take that out we're about right. "This has been a great series - remember we had Alex Hales in a walrus mask." Michael Vaughan adds: "He might want to bat in one, the way he's been going." Now Reece Topley has nailed down his place at the top of the order for the Test tour to the UAE, he switches off and plays back to a delivery from the spinner which hits him in front. Well batted young man - he and Rashid added 32 runs there. You never know... they could be key later. With Eoin Morgan not batting because of concussion, England set Australia 139 to win the ODI series. "Rashid has had to play the situation, turning down singles to protect Topley, but this is really good batting from him. I don't think we'll see Agar bowl a third over, the quicks will be back." This is like finding a fiver down the back of the couch a day before you get paid. Adil Rashid sweeps Ashton Agar for four and then belts six down the ground. Scenes. "When Reece Topley joined Adil Rashid, there was a slight sense of anti-climax inside Old Trafford. Sunny day, full house, beer flowing, yet cricket disappointing. If optimism is yet to be fully restored, there's at least been something to cheer about. Every Topley forward defence is given more of an ovation than anything Australia do." Ex-footballers Peter Reid and Bryan Robson stand chatting in one of the posh boxes. Both men will be enjoying this combative batting from Reece Topley and Adil Rashid. This is fine entertainment - Reece Topley harking back to the days of Phil Tufnell and Peter Such with a tentative poke to third man which brings a single. Every run is massive in England's predicament and Adil Rashid's lofted two into the leg side is warmly applauded by the crowd. Four from the over. Peter Gowers: On a plus note, we may have found our new Test opener in Reece Topley. "It was a risk picking Topley as Liam Plunkett had played well at Headingley, but I can see why they think Topley can be a key member of the side looking ahead to the Champions Trophy  and then the World Cup in 2019." Ashton Agar is the next to have a pop at Reece Topley. The Aussies are lining up. The England number 11 is seeing them all off. Jay: I haven't seen anyone play a good yorker as uncomplicatedly and easily as Topley. Top batsman. Tattz: Relax everyone. We've already bowled this lot out once this summer for 60. We have twice the amount of runs we need. "If they can find their way to 150, you never know. Australia have been bowled out cheaply a couple of times this summer." Reece Topley might back away from the ball, but his forward defence/poke is in good working order. Another over survived. Mary Rodger: The wonderful spirit of cricket shown by the New Zealand team this summer. "There are very few cricketers who have more appearances than runs. Before hitting that five, Reece Topley had scored 103 runs from 105 professional games." Ed Dymott: Is Topley the first ever one-day batsman to score a five as their first runs in a one-day international? The magical 120 mark is brought up by England. With 21 overs left, we can still get 300. "I think Topley might have to face a few short balls here." Nicholas Cram: Haven't seen a real bunny like Topley for a while, straight from the Devon Malcolm school of batting! Paul Cotterill: Spectators at Old Trafford may want to go to the v. good Manchester Museum of Science & Technology after the game. Should be time. Reece Topley's first runs in ODI cricket arrive as a five. He pushes a single into the off side, Australia take a shy at the stumps, miss and it goes to the boundary. Pat Cummins is back into the attack. Good luck, Reece. The England boys are ready to go out and field at a moment's notice. Adil Rashid is going nowhere for now, though - patting back a John Hastings maiden. Ed Palmer: Don't see what the problem is... Double the score at 30 overs... We're looking at 300 odd. Trevor Allison: Absolutely disgusting effort from Eng! Game over halfway through 1st innings on the day I attend, who do I see for refunds?